Over the past several months I have noticed an increase in the number of similar updates from friends and colleagues. These fake Facebook profiles are popping up all over the place. These accounts are created by hackers, but they are not breaking into your account through emails and passwords, rather, they are gathering public Facebook information and creating a second you. It is important, therefore, to be confident about the information you share with friends and the public. The large horizontal image at the top of your Facebook personal profile is your personal cover photo. While some people have chosen not to upload a custom image, many people have taken the opportunity to showcase family, wedding, vacation, or personal photos. It is important to be aware that these photos are visible to the public and that anyone can save these photos to their desktop for their personal use. If you are concerned about your privacy, consider removing this image. Your Facebook profile picture is the image that appears whenever you create posts, or comment on friend’s posts. Users can change the privacy setting for each profile picture either to public, friends, only me, or custom. If users are concerned about their privacy, it is recommended to set the profile picture privacy to, at a minimum, “friends.” While the standard blue silhouette will be visible to non-friends, this ensures only your friends can view your latest profile picture. Lately Facebook has been actively encouraging users to update personal information, including current location, hometown, relationship status, work, and education. Many times, however, the default setting for all of this information is “public.” Take a peek at this section to ensure you’re not oversharing your personal life, and that you have set the appropriate privacy settings. Hiding your Facebook friend list from the public is the most important component to securing your personal privacy. Without this vital list, hackers will be unable to send misleading requests to your existing friends. To update your settings, from your personal profile click “Friends,” then in the top-right, click the writing utensil, selecting “Edit Privacy.” Select “Only Me” as the privacy setting. This ensures that only you can see your friend list. 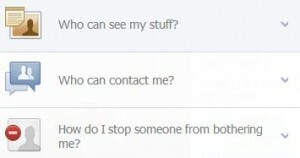 Remember folks: Just because Facebook asks you to include key information, does not mean that it is a requirement! Only share information with which you are comfortable. Have additional questions? Just ask below! The image-sharing social media platform Pinterest has experienced significant growth in both users and revenue throughout the past year. Initially used for personal use, Pinterest introduced business accounts in October 2012. Sign-up for a business account by visiting: http://business.pinterest.com/. 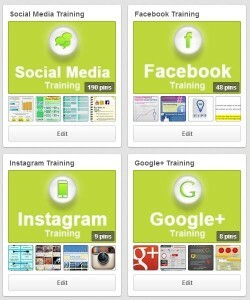 Already have an existing Pinterest account? No worries! You can convert from a personal to business account. Simply log into your account and navigate to: http://business.pinterest.com. As it stands, business and personal accounts are free to use and also have access to the same features. That being said, the Business Terms of Service are different from those of personal accounts. Always read through terms before getting started. After setting up your Pinterest account, it is important to brand your profile such that it is consistent with existing online media. Include your business’ name, username, bio, location, photo, and website. When using Pinterest for business, users are encouraged to use either a branded corporate logo or professional photo. Don’t get stuck with a pixelated or stretched photo! Pinterest profile photos are 165 pixels by 165 pixels, but Pinterest recommends square dimensions that are 600 pixels by 600 pixels. Business’ have the opportunity to have their website verified by Pinterest. Translated: A verified website confirms the user’s ownership of that site. Verified websites are indicated with a small checkmark on their profile page. At the moment, only one website can be verified per account. board covers. Rather than choosing an image from a pre-existing pin, custom covers are a great way to develop and maintain your business’ brand. The dimensions of board covers are 217 pixels by 147 pixels, and must be individually uploaded and selected as the board cover. Now that your account is set-up, start pinning relevant and engaging content for your followers. Just as the world continues to turn, social media continues to change and adapt to the marketplace. Over the last month there has been a number of significant changes to social media platforms, including Facebook, Twitter, and LinkedIn. Read All the Terms of Service here. It appears as though Facebook pages are clear to post whatever they choose for their cover photo! Make sure, however, that it is consistent with your company’s brand image and engages your fans. Slowly. User by user. Facebook is replacing the old top-bar navigation with a slick left-sidebar navigation Newsfeed. The Newsfeed is an aggregate of update from friends and pages you follow. If you haven’t noticed changes yet, don’t worry they are coming! If you would like to stay ahead of the curve, request to be put on the waitlist here. Twitter has made it easier for users to update graphics on their profile. The button “Edit Profile” appears underneath the header image on your Twitter page. Clicking the button allows users to edit their name, bio, location, website, and image without transitioning to a new screen and navigation. Check it out to see how simple updating your Twitter profile is! Images, Documents & Presentations – Users can enhance key sections of their LinkedIn profile, including Summary, Education, and Experience with images, documents, and presentations. If you work within a visual industry, like graphic design or web development, take advantage of this new feature to input samples of your work with a keyword-driven title and description. Links – Users can also direct people to external websites or social media platforms, like Twitter, from their LinkedIn profile. The link will include an image from the destination site. A cover photo is the large horizontal image that is located at the top of your business page. It is meant to be a visual representation of your business. These photos, which are 851 px by 315 px, could not include more than 20% text, including text in images. Very quietly, however, Facebook removed the 20% rule from images. This meant that if text was shown within images, it was acceptable. Facebook removed the 20% rule completely from their Terms of Service completely. Perhaps because trying to determine if your cover photo exceeded the limit was a pain. Although there are tools available, like the grid method, they are not an exact science. Don’t go adding text all over your cover photos, as it’s been found that the most effective are a combination of fabulous images and some text (perhaps a little more than 20%!). Have you ever scrolled through all the pre-loaded images when posting a link, and disliked them all? 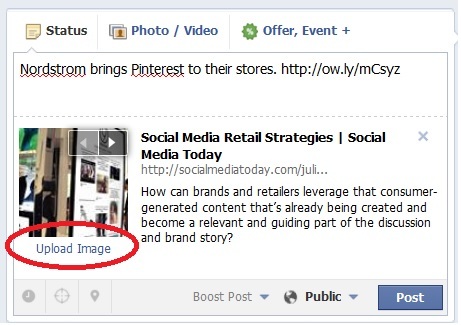 Facebook now allows users to upload a custom image when they upload links. After pasting the link into the status update, check out the loaded image in the bottom-left. There will be text indicating “Upload Image.” If none of the photos are applicable to the link (which sometimes they are), upload your own! There’s also been lots of talk about Facebook Insights improving their analytics. Although it has been rolled out to some users, it’s not available for everyone… yet. Facebook page notifications are also changing… soon. I experienced the new layout last week, but then it quickly reverted back. Always changing. Always improving. Good ‘ol Facebook.